[Review] Is MyCashinHand.com Real or Fake? Are you one of those users who are excited to earn money to this website, mycashinhand.com? Sorry to burst your bubble, but that website is completely a fake internet site. Here are the reasons why! Question: Is MyCashinHand.com Real or Fake? 5 Reasons Why MyCashinHand.com is NOT worth for your time? 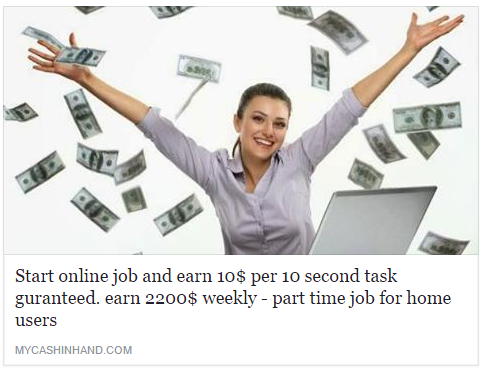 MyCashinHand.com is yet another website that guarantees you to earn an amount of $10 per second task, yet the only job you are working with it is simply sending an annoying referral link. I said annoying because it spam to your wall, especially on social media like Facebook. Will you fall on this trap? It is trash, the developers have no sense of style, although, it is simple, if they are trying to have a business, they should have a decent logo at least. It is entirely pure and straightforward, which means, there are no sufficient security features to the website itself. Be extra careful in giving your details, you will be shocked when your email has tons of spam messages. Because they will sell your details to other third-party websites. Don't lure on such figures, it is indeed deceiving you. What kind of business website is this? There is NO about or contact, though. If you want valid proof, then a forum is a place where you can find pieces of evidence. Unfortunately, there is no DISCUSSION Forum installed on the website. In short, it is really a fake internet site. Don't fall to the figures you are expected to earn, because of it just lures you to register. Thereby, they will use and sell your details to other entities. To prevent that happening, you MUST not engage or register to MyCashinHand.com. Better try ClixSense, although, I must admit it is hard to earn huge amount of money, still it is a legit one.